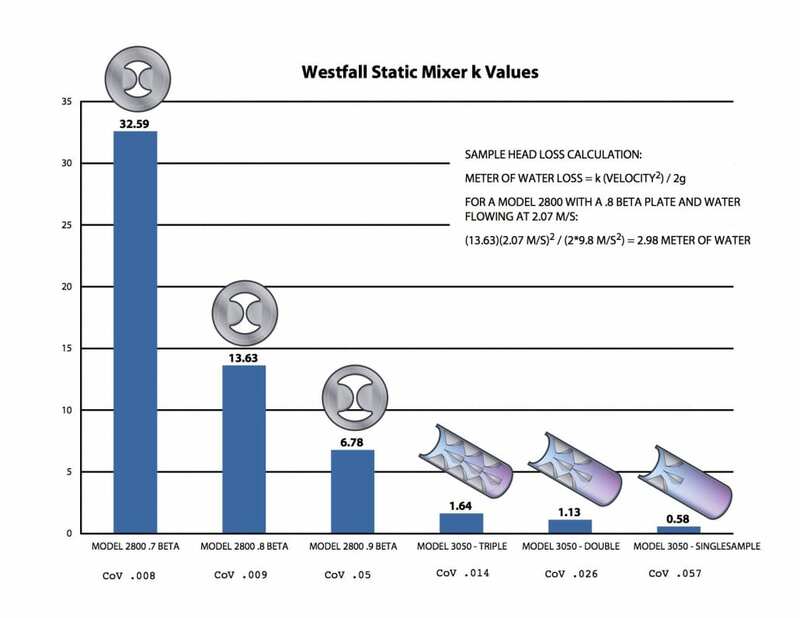 The chart below illustrates Westfall’s 2 main static mixer designs, the Compact High Shear Model 2800 and the Low Headloss Model 3050. All models meet or exceed standard homogenization requirements while creating less headloss than their competitors. All models are made to customer specifications. Step 1 Pick the mixer that meets your headloss requirements. Westfall’s 3050 static mixer generates 2 to 4 times less headloss than other mixing solutions. Step 2 Determine the space (laying length) available. Westfall’s 2800 mixers have a slim profile and deliver full mixing within 10 diameters. Step 3 Pick the right materials for your application. Choice of all engineering materials includes Stainless Steel, FRP, Hastelloy C276 and Teflon(R) coating to protect against corrosion.